I’ve always loved a denim dress. Denim dresses are such wardrobe winners because they’re often available in a style that’s versatile enough to work across both work and casual wardrobes. Simply change up your shoe or accessories and you’ve got a completely different look. That’s probably what I love about denim dresses – they’re ability to work with whatever you’re doing in any given week. 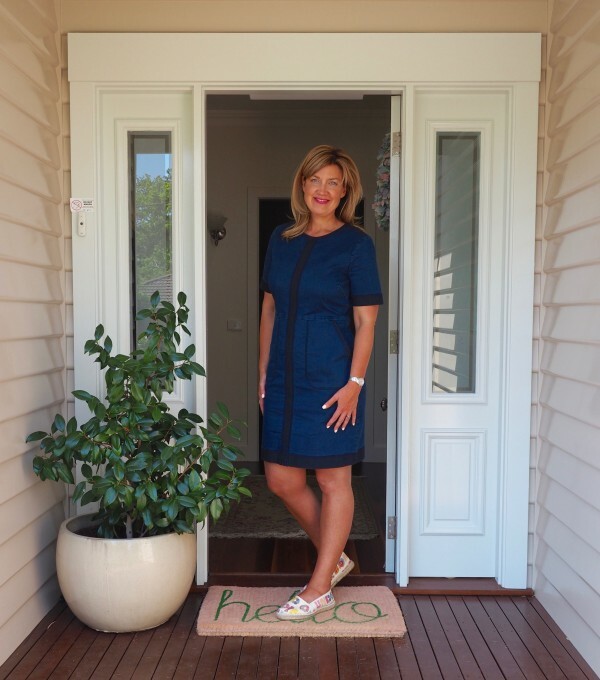 Perhaps that’s why I sat up and took note when I came across this Fitted Denim Dress from Country Road (pictured above), part of the latest January drop which is looking towards Autumn. It’s a bit different from what’s around. It has that flattering elbow length sleeve that I can’t get enough of. The dark denim looks great against a tan (mine is of the spray variety) and the fitted style (with stretch) creates a flattering shape without the need for a belt. And while it may not be your high summer friend, this is a dress that is perfect for cooler Summer nights and mild Autumn days. I could even see this dress paired with tights and boots down the track. So I’m wearing this dress three ways to show how a simple change up of accessories and shoes can transform this dress. And, I’ve styled it for how I spend my January – casual, smart casual and casual with heels. (Yes, January has been a pretty casual affair around these parts!). The first outfit is my casual version – all I’ve added here is a comfy pair of Chazal Espadrilles from Obus. This is an everyday outfit for me – think school run, weekend admin or play at the park. I love an espadrille at the best of times and these have proven to be super comfortable and a good closed toe option for Summer in between pedis too. Outfit two is a little dressier – I’ve added some some beaded bracelets from Small Vollee and my fun new deep sea sandals from Gorman (style sister to my fave pink sandals), picked up in their recent shoe sale. I’m loving their metallic shimmer in some of my favourite colours. This outfit is a bit dressier than the previous and says to me weekend lunch, BBQ with friends or dinner at the pub. The final combo is the marriage of two of my favourite things – denim and leopard print. A simple combo that is always stylish in that effortless but effective way. I’ve been returning to this pairing time and time again this summer – leopard print shoes and a chambray dress, leopard print shoes and a black dress with a denim jacket. I picked up these wedges in a Coach outlet in LA last year for a song and man, have they been worth it and then some. They are super comfortable and paired with some rose gold accessories (including this bracelet which is still available in silver here), all of a sudden my denim dress is saying Hello Date Night, Party Time or Drinks with the Girls. Size wise, I’m wearing size 12 which sits comfortably on me. As you can see, at 175cm (5’9″), this dress sits a good couple of inches above my knee. If you’re on the look out for a new denim dress in a different style, you might like this denim pinafore from Seed Heritage or this more casual, shorter style by Living Doll from Birdsnest. * Stay tuned for more on chambray next week. Hands up if you love a denim dress? How do you style yours?